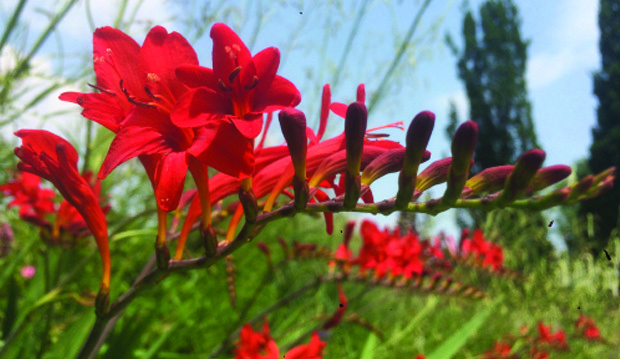 By far, the most popular flowering plant is currently Crocosmia ‘Lucifer’ (montbretia) in the Entry Garden, with scarlet-red tubular flowers on 91-centimetre (3-foot) arching stems, this clump-forming plant is drought- and humidity-tolerant. 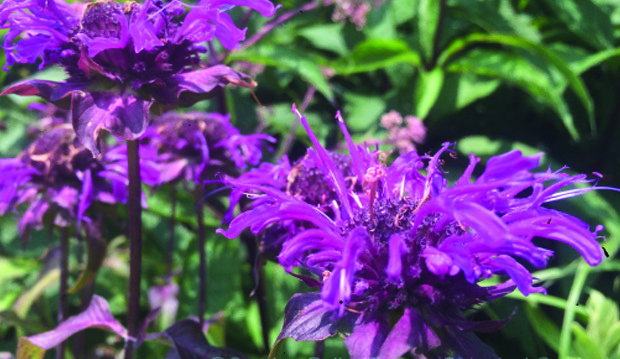 Next to the Crocosmia, you’ll find the reddish-purple flowers of Monarda ‘Scorpion’ (bergamot). 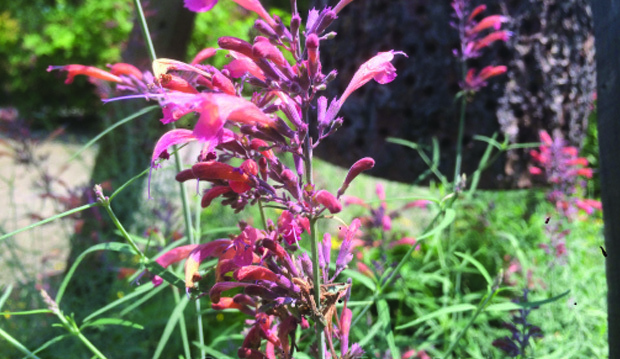 The stems and bracts are a deep purple. 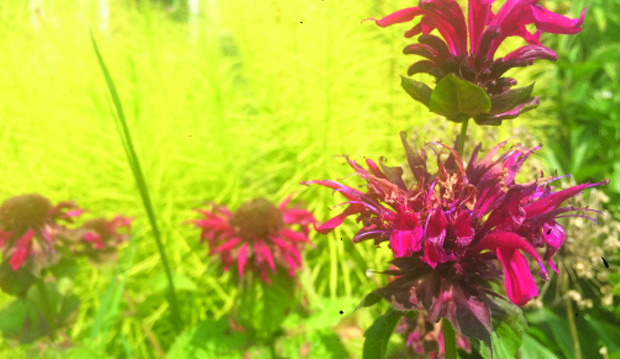 Monarda ‘Fireball’ (wild bergamot) in the Entry Garden near the shed, has large ruby-red flowers on a compact plant. 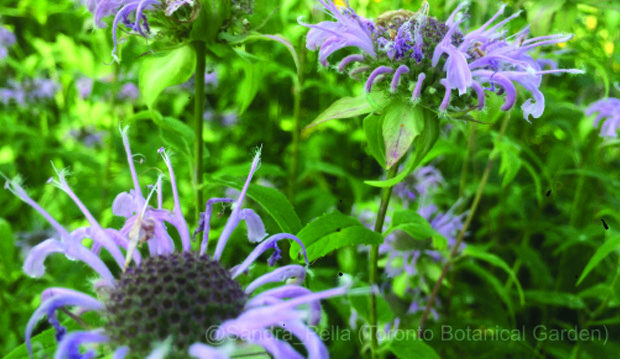 I really like Monarda fistulosa (wild bergamot) in the Woodland Walk, with pink-lavender blooms. 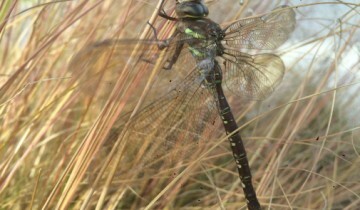 It is a native throughout Canada. 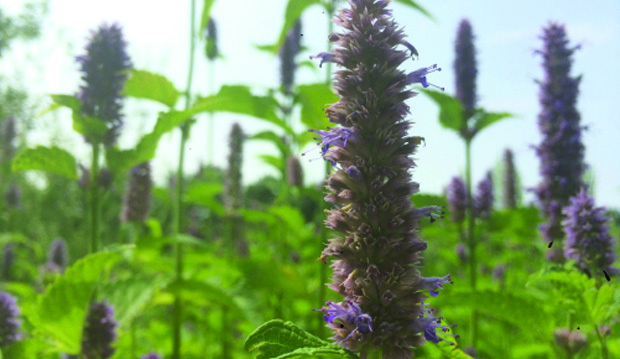 In the Woodland Walk meadow is Agastache foeniculum (anise hyssop) with lavender-purple flowers. 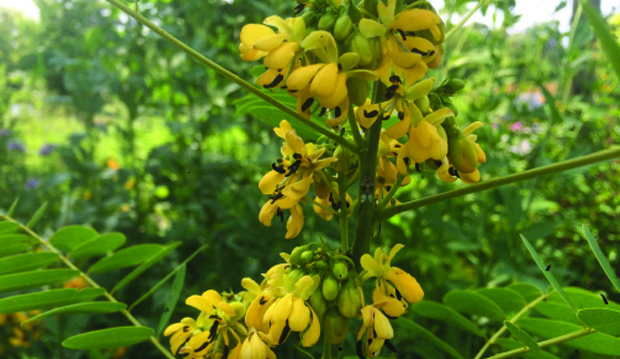 It has a long blooming period and is native to Ontario. 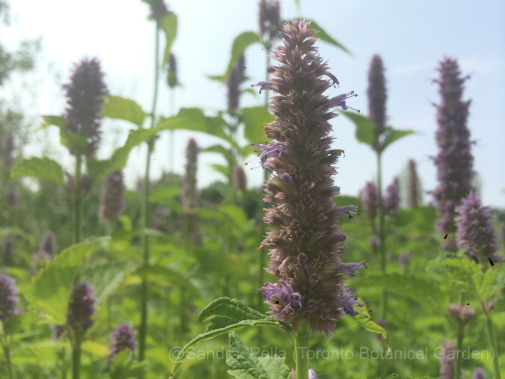 Agastache rupestris (threadleaf giant hyssop) in the Kitchen Garden large circular bed, has burnt-orange flowers with purple calyxes (two colours I love). 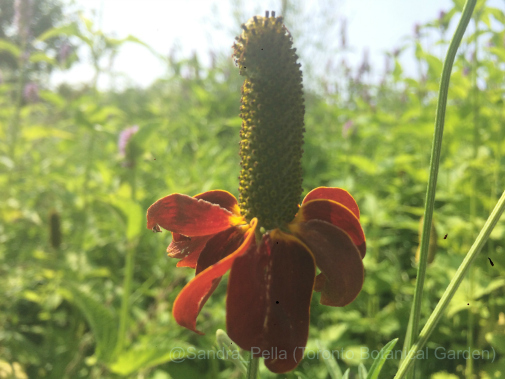 In the Woodland Walk meadow, Ratibida columnifera forma pulcherrima (Mexican hat plant, long-headed coneflower) has brownish-purple rays. 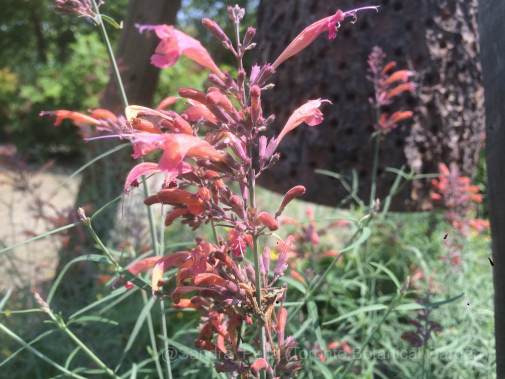 It’s been in flower since late June and will continue until September. 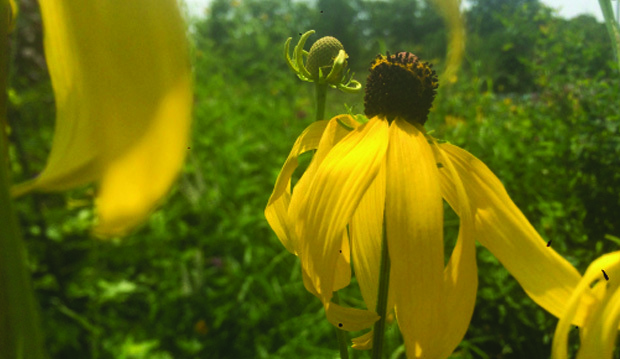 Ratibida pinnata (grey-head coneflower) has bright-yellow rays facing downward; the tall stems grow to 1.5 metres (5 feet). 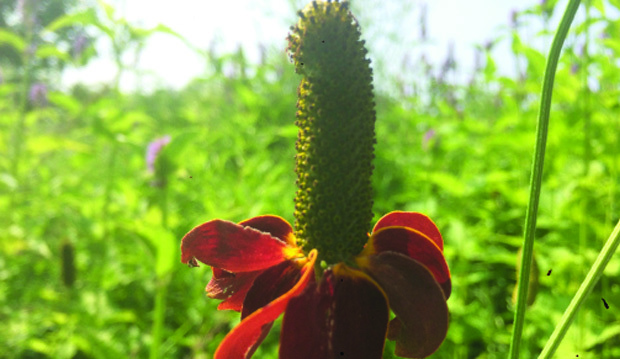 In the Woodland Walk meadow, many are taller than that. 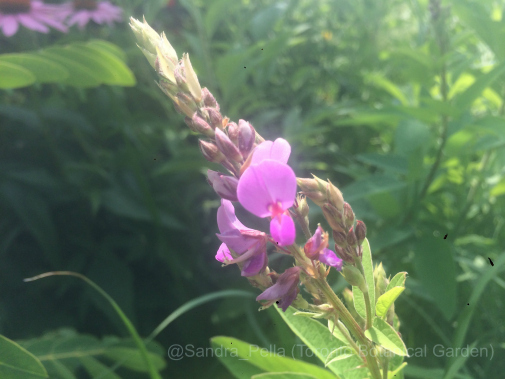 Another meadow plant currently in flower in the Woodland Walk, Desmodium canadense (showy tick treefoil) belonging to the bean family, has numerous pink flowers at the ends of its upper stems. It will reach 91 centimetres (3 feet) or more, sometimes spreading out over the ground. 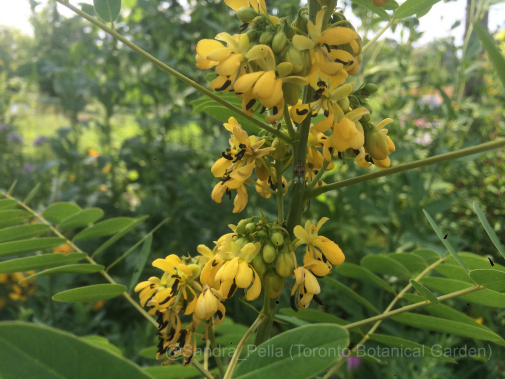 Senna hebecarpa (wild senna) is a herbaceous perennial reaching up to 1.8 metres (6 feet) with yellow flowers that are attractive to bees. It is in the Woodland Walk meadow. 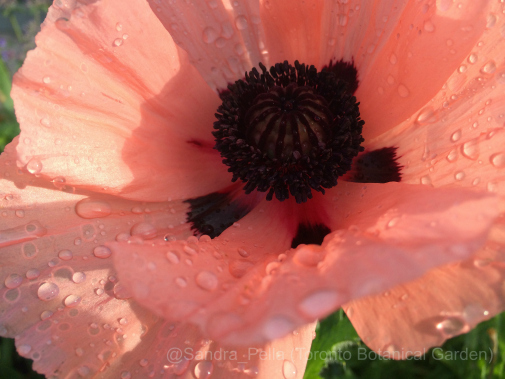 Anemones are in bud or bloom. In the Entry Garden close to the path, Anemone hupehensis ‘Pretty Lady Emily’ (Japanese anemone) is in flower. 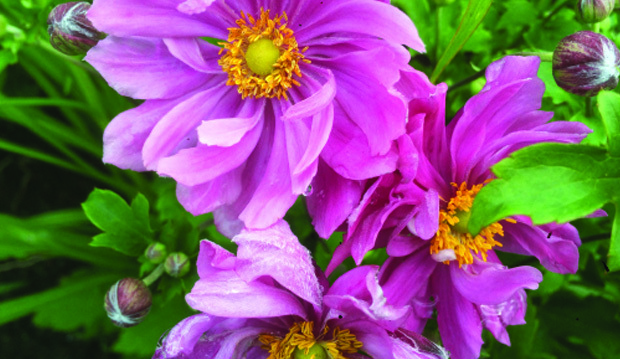 This compact plant from the Pretty Lady series features double, light-pink flowers. 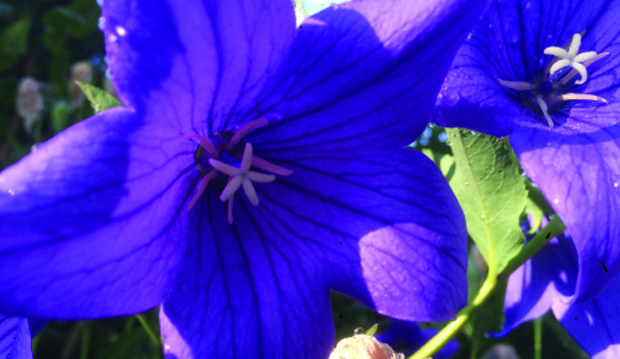 One more for the road (and not in a meadow) is Platycodon grandiflorus ‘Blue’ (balloon flower) in the Garden Hall Courtyard bank. 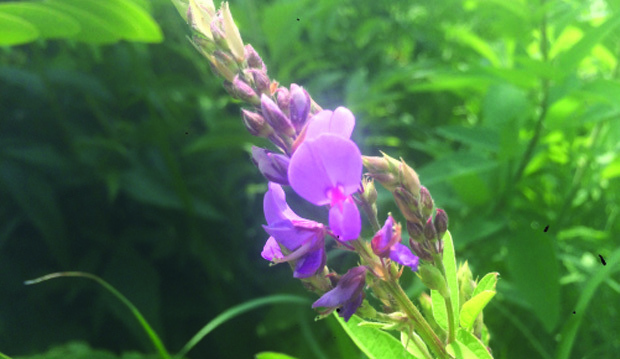 It has violet-blue veined flowers. 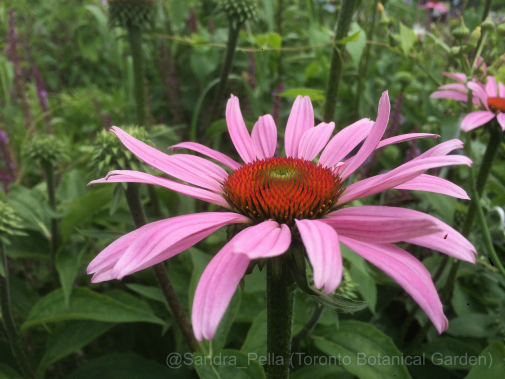 Plants are long-lived but dislike division or being moved due to the nature of the root system.